Stats, Maps n Pix: DataFest 2016 - what was all that about? Emily Grossman - from the telly, obviously, but also a top scientist and data boffin. Joe Twyman - Head of Political and Social Research for Europe, Middle East and Africa at YouGov, and generally all-round good guy (he bought a round of drinks for EVERYONE at DataFest!). In addition, we had input from Jackie Carter from the University of Manchester Q-Step team, Julie Scott-Jones from MMU, Chris Forde from Leeds and our good selves at the University of Sheffield. 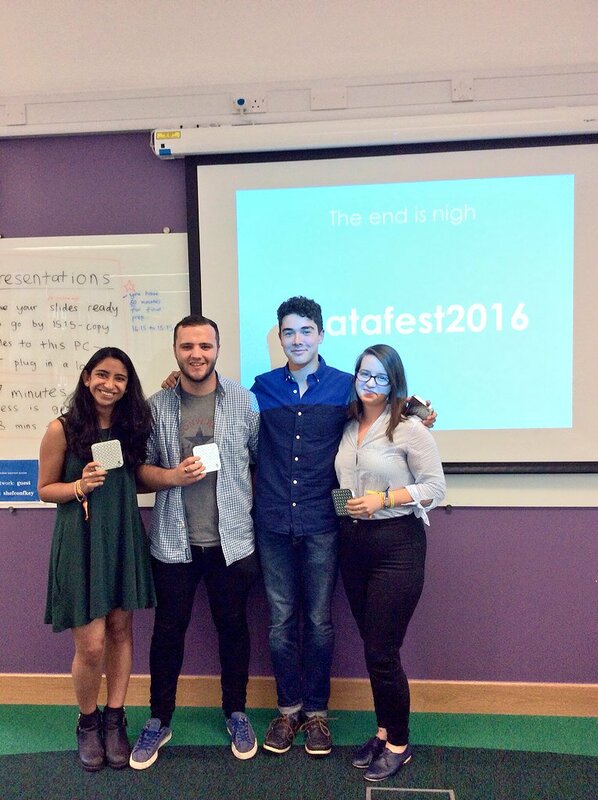 Even so, getting students to come to something called DataFest, of their own accord, during the summer, is a bit of a hard sell. 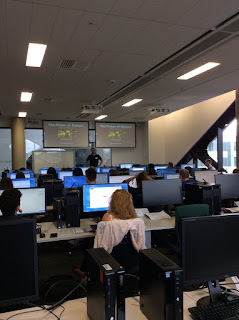 But somehow, some way, they came and for four days we had 30 students unduly excited about data and methods. 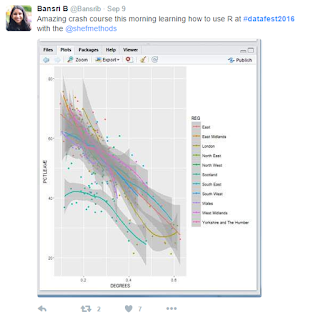 Hours-wise, it was like a full module for each student so they learned a lot, including dabbling with coding in R, as you can see below. The students who came were mainly second and third year undergraduates and all from social science backgrounds. I'd say we pitched it about right and every single person there really got stuck in and learned a lot - so thanks to all for making it a success. 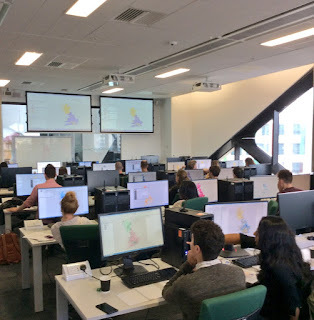 I also did a session on dataviz, as you can see below. 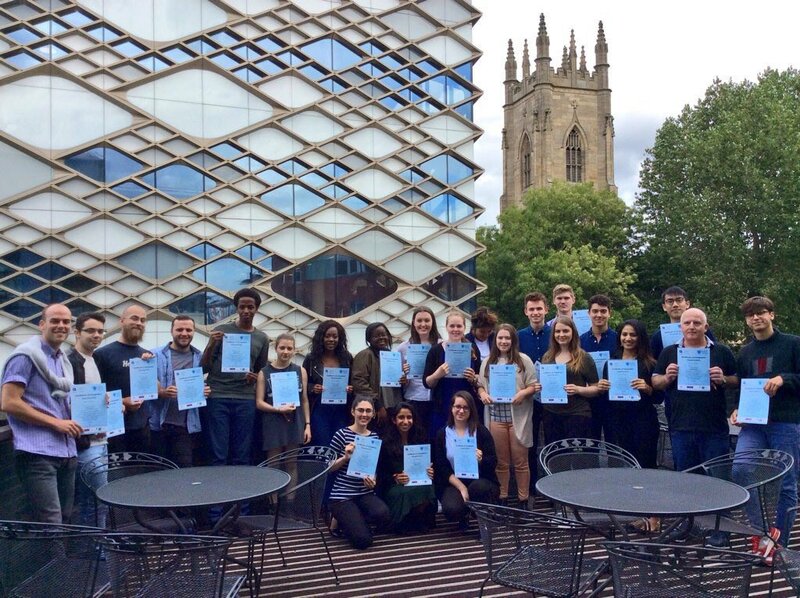 At the end of the week, each group presented their findings on the question of 'what caused Brexit?' 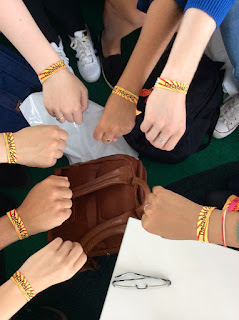 which was a theme for the week - well done to Group 2, who took away the winnings. Finally, we actually managed to use our rooftop terrace because the weather was amazing all week. This provided a nice venue for eating the piles of pizza delivered during the week and for the final DataFest 'graduation' shot - you can see some of the people who attended below with their certificates. As a bonus, when we were coming out of the computer lab one day, we bumped into some friendly University of Sheffield robots, so I'll leave you with this. They made DataFest 2016 that little bit more interesting. Acknowledgements: the images here were mostly captured by our marketing and PR guru Sophie Hawley, and the original set-up was done by viral content whiz Hazel Moss. 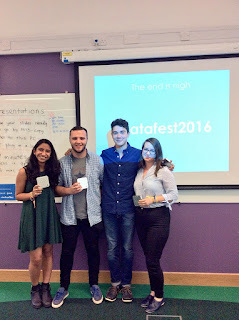 SMI Manager Ruth Bartles decided that 'DataFest' was catchier than 'Quantitative Methods Summer School' and also got all the logistics sorted. Dominos did the pizza... Simon Gallacher and Hannah Broad from our funders (The Nuffield Foundation) also visited on the last day, which was very nice of them.